Sapphire and pear cut diamond ring. This sapphire and pear cut diamond ring was a bespoke ring order, commissioned as a surprise gift, from a chap to his wife. 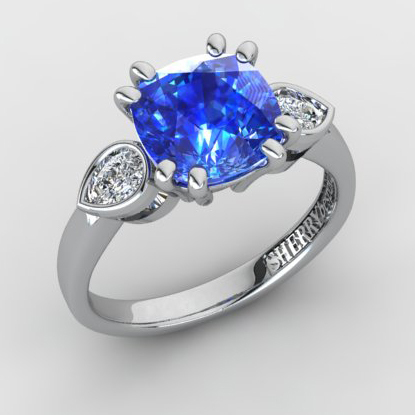 The sapphire is a super, 5.07ct natural, untreated ‘Kashmir’ blue, set into double claws at each corner of the cushion shape. Set either side, in smooth rub-over settings, are a matching pair of pear cut diamonds. They are G VS2 and have a total weight of .37ct. The ring is made in 18ct white gold and is a bespoke ring design, protected under Sherry Jewellery copyright.